Based on protein plants, pasture and fodder, Orlando Corrales produces cow and goat milk on a farm located next to a major road in the Cuban capital. "We do not use any industrial feed here," he says proudly. Early in the day, when a gentle dew moistens the ground and vegetation in the mountains of eastern Cuba, street vendor Raulises Ramírez sets up his rustic stand next to the La Farola highway and displays his cone-shaped coconut sweets. “You have to have good and varied seeds to test which one adapts best to each kind of soil,” says 71-year-old farmer Rubén Torres, who on his farm in central Cuba harvests 1.6 tons of organic beans every year, among other crops. 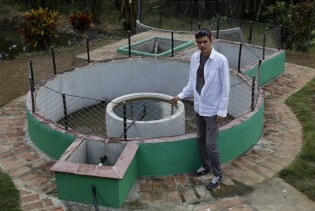 Protected from the sun by broad-brimmed hats and long- sleeved shirts, workers at the La Juventud fish farm throw fish feed into the tanks for the tilapias, a fish that is scarce and in high demand in the Cuban markets. A middle-aged woman arranges bouquets of yellow roses in a street market in Little Haiti, a slum neighbourhood in the capital of the Dominican Republic. “I don’t want to talk, don’t take photos,” she tells IPS, standing next to a little girl who appears to be her daughter.